Polyclonal antibodies present in the serum of immunized animals, which can be obtained by direct isolation from the serum. Due to the advantages that it can recognize multiple epitopes, can cause agglutination reaction, precipitation reaction and so on, polyclonal antibody is widely used in the field of immunological diagnosis, often used as enzyme-labeled secondary antibody in Western blotting experiments and coating antibody in ELISA experiments. 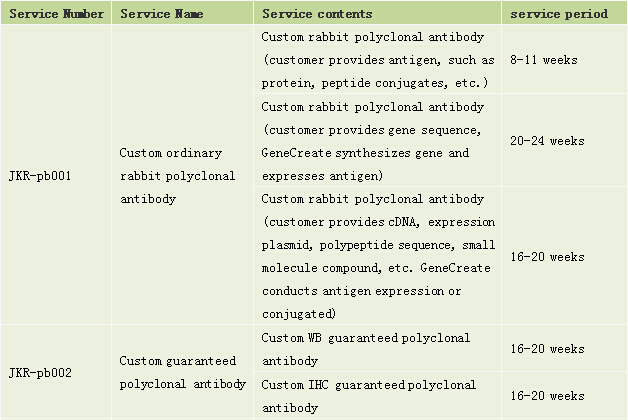 GeneCreate’s polyclonal antibody preparation platform established a series of technology platforms and animal breeding bases with antibody platform at the core, it can provide multiple polyclonal antibody preparation service systems include rabbit, mice, rat, guinea pig, etc. for your free choice which belongs to your specific needs! Survey reports, including the immunogen sequence, SDS-PAGE electrophoresis pattern, expression clone sequencing report, ELISA titer assay results, and according to customer needs, provide antibody verification result, such as WB, IHC, IP, IF, etc.